We hope everyone had a wonderful Thanksgiving! We had a fairly typical Thanksgiving meal this year, with the centerpiece being a puff pastry vegetable pie layered with kale, butternut squash, and mushrooms. The puff pastry was a modified version of this Emeril recipe, using Earth Balance instead of butter. We also had roasted potatoes and beets (the 3-year-old loves beets), steamed green beans and cranberry sauce. Sometimes we do a more complex cranberry sauce recipe, adding other fruit or spices but this year we kept it super simple. It perplexes me why people buy cranberry sauce in a can because if you buy a package of fresh cranberries there’s usually a recipe right on the bag and it couldn’t be simpler: toss the fresh cranberries in a saucepan with water and sugar and simmer until the cranberries break down and start to thicken. To wrap up the meal we had a pumpkin pie. Though it wasn’t actually made with pumpkin but rather with butternut squash. We had a huge volunteer butternut squash patch sprout from our garden this year and we still have quite a few of the squash stored in our basement. It’s fairly interchangeable with pumkin so keep that in mind next time you want to make pumpkin pie! This was our 17th vegan Thanksgiving so I don’t want to hear about how you have to eat turkey on Thanksgiving because it’s tradition. This is our tradition. More often than not in years past we’ve cooked a huge feast just for us but this year we were happy to have some friends join us for dinner. It was nice to have good company and nice to share the cooking. 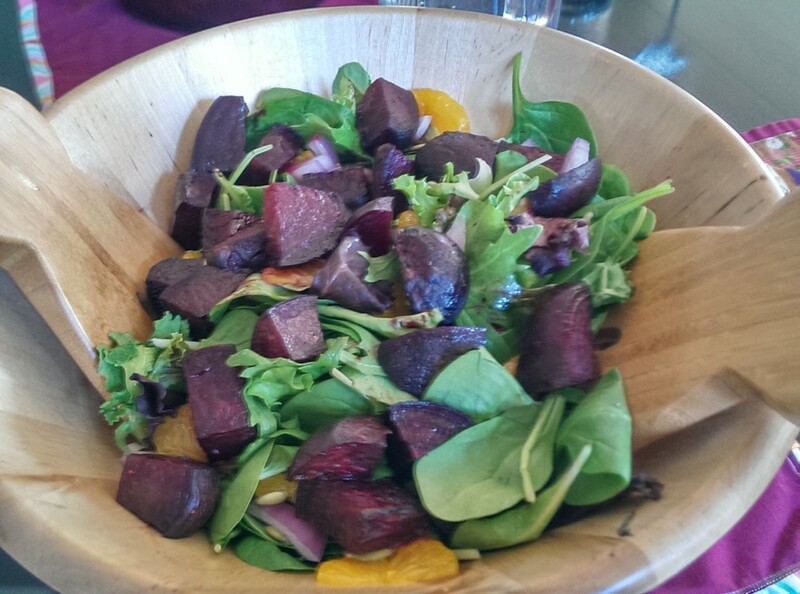 They brought a fabulous salad with roasted beets, mandarins and an orange vinaigrette, mac & “cheese” and an apple crisp. Since we had guests I didn’t spend a lot of time taking pictures but I did get a quick shot of the salad. 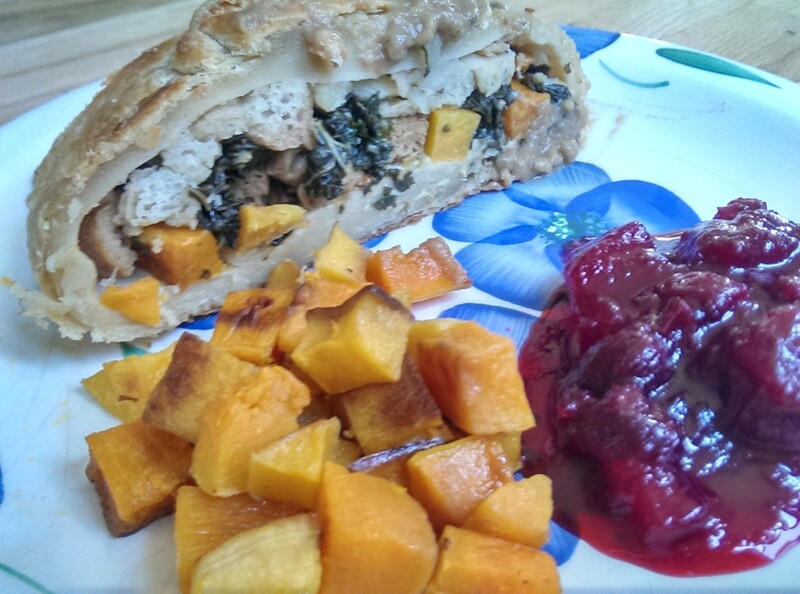 We made a pumpkin pie, cranberry sauce and the main course – a vegan wellington filled with apple-sage stuffing, greens, maple-glazed seitan and roasted butternut squash and topped with sage-walnut gravy. 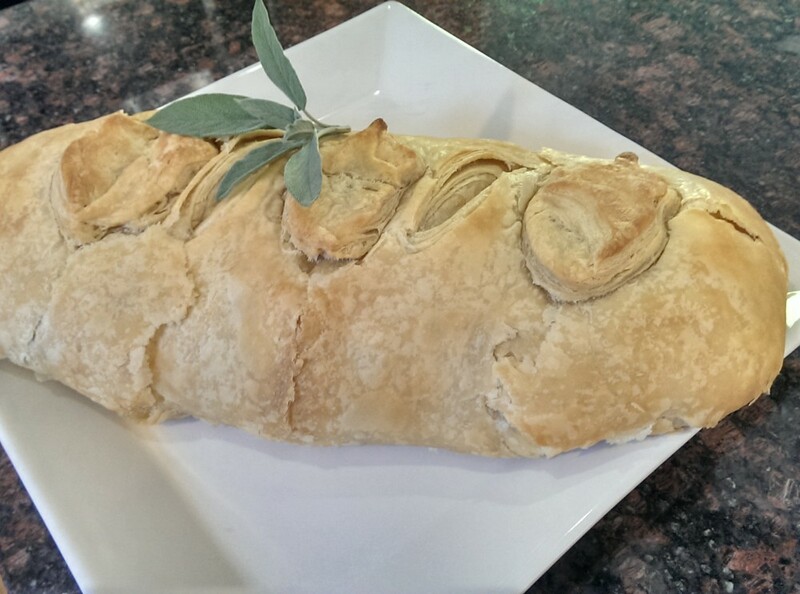 The wellington was something new this year but we regularly break out the puff pastry for holidays. For the stuffing: I sauteed a little minced onion and diced apple in oil then added some day-old bread slices that I chopped up along with salt, pepper, fresh sage and thyme. Then I added vegetable stock until the consistency was to my liking. For the greens: I sauteed kale with garlic and olive oil then added a little fresh thyme and lemon juice at the end. For the seitan: Fry seitan cubes until brown then quickly mix in a tamari/maple syrup mixture at the end. For the squash: Peel, seed and cube a butternut squash, then mix with olive oil and salt and roast until tender. To put it together: Roll the puff pastry into a large rectangle, about 15″ x 20″. 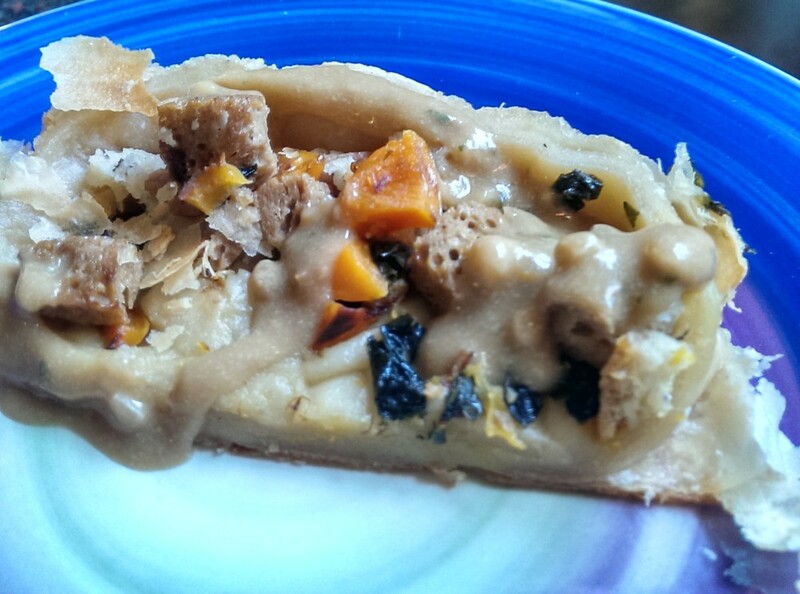 Spread the stuffing over about the middle half, top with the greens, then the seitan, then the squash. Brush some water onto one side of the puff pastry, fold the opposite side over the filling then close it up and seal it. Fold the ends on top then flip it over onto a baking sheet. Bake at 400° for 30 minutes. It’s a fair bit of work, but well worth it for a holiday meal. 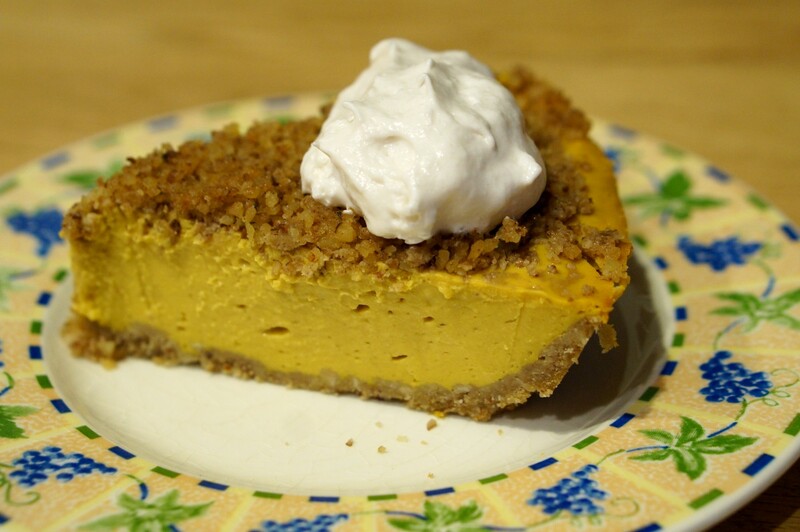 Same goes for the pumpkin pie that Darlene made, mainly using the recipe in Vegan Pie in the Sky with an almond crust. 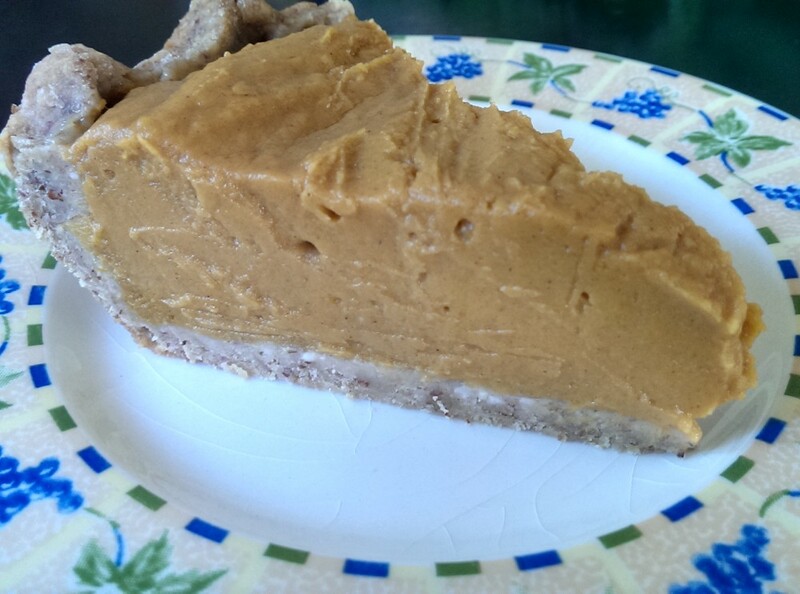 The pie was amazing and had not just fresh pumpkin but sweet potatoes in it as well. And the crust was made with almonds and white whole wheat flour – again with the healthy whole grains! We love having Thanksgiving leftovers the next day too!